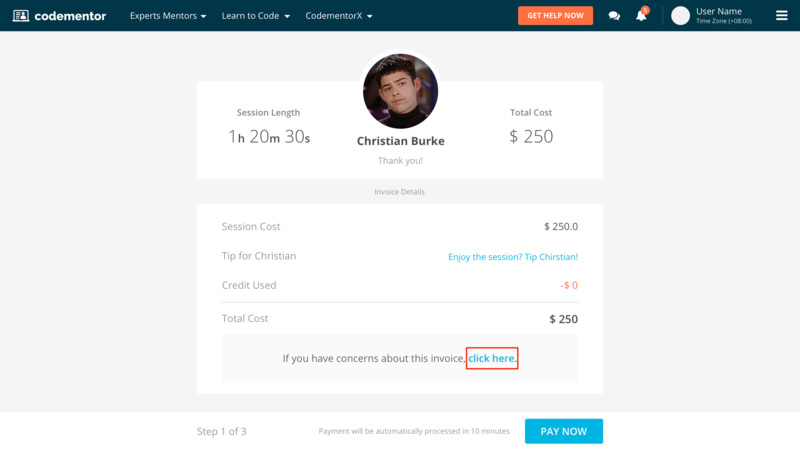 Codementor Support - How do I request a refund for a live session? All Categories ​>​ I&apos;m a User ​>​ Billing ​>​ Billing for Sessions and Freelance Jobs ​>​ How do I request a refund for a live session? 1. Right after the end of the session, click the 'initiate a dispute' button and let us know why you are requesting a refund. By doing so, our team will be automatically notified to follow-up and investigate. 2. Kindly ask the mentor to refund the session - instructions here. Once the mentor issues a refund, we will process this and you should receive the refund in a few business days (depending on your bank). 3. If you are unable to click the 'initiate a dispute' button, please contact us. Be sure to let us know which session you are referring to (which mentor, duration, etc. ), and provide us with more information about why you are requesting a refund so that we may investigate your case.